HAPPY NEW YEAR! What are your goals for 2017? Briefly … we got all our shopping, mailing of ‘away’ gifts, baking, and preparations finished on time – Yay! – minus mail-out cards that I didn’t do. On Christmas Eve we had six family members come by, then on Christmas day seventeen of us met around Dad’s dining-room tables (two tables end-t0-end) and enjoyed a delicious dinner to which all eight households had contributed. Gifts, desserts, and clean-up followed that. Afterward, my sister and family went home to enjoy their own time together, and my daughters and families and my dad all came to our house where my husband and I hosted another round of gift exchanges, snacks and an enjoyable evening get-together. It was a busy family day. Dad and I then went back to his house for sleep and the start of my week there. On New Year’s Eve nine of us got together at Dad’s for games, snacks, and fireworks. Now this week I’m home where I have so much to do! The rest of this post is about my goals for 2017, decluttering what remains of past creative interests being one major project. I love to sew but rarely get to do that anymore, so I will pack up the huge collection of beautiful fabric to sell – what I know I’ll not use myself. Most was part of the online retail business I had for a while that had to be set aside. Now I need to sell off the greater part of it to reclaim my space. Know that feeling? Along with that I have lovely sewing embellishments and crafting supplies to liquidate. Life circumstances can change one’s plans a great deal. I had hoped to sell most things through my business; now I’ll let them go at even lower prices. As yet I have not managed to repurpose the room I had for my publishing. That room is planned to be my writing room; however, there is much to pack up and get rid of first, including the antiquated duplicating machine I used. It will be set out by the road during Spring cleanup and hauled away if I can’t sell it cheap. My underlying goal for which all the aforementioned is aimed is to write, write, write. I’ve signed up for Storystorm (the new name for Picture Book Idea Month) hosted by Tara Lazar for the whole month of January. It’s no longer only for picture book writers. Next week I will be renewing my membership in the year long 12×12, hosted by Julie Hedlund. I still have manuscripts to bring as close to perfection as I can, and then start the process of submitting them. The one I sent out late in 2016 has not seemed to hit the mark (the publisher will contact me by the end of January if interested), so after January I will have to revisit that manuscript and find other places to send it. (I could do it now but, obviously I have other things to do.) I’d love to have an agent, so in order to be ready for that search I have to prepare several other of my stories to completed as-good-as-they-can-be manuscripts. Another of my goals is to set up much better records of submissions, rejections and all that fun stuff. Oh, and I must not forget the many books I want to read! It’s your turn. Tell me … what are YOUR goals for 2017? 2016, my year of change. For me, change means stepping beyond myself, my comfort zone, my place of safety. Even if that step is only a baby step, it is a step forward to my goal. I am not saying I want to change everything about myself, or that I want to make drastic changes in my life. What I mean is I am working on my attitude and beliefs about my God-given abilities, talents, gifts, creativity. And fear – I am making baby steps away from the fear and toward the reality of who I am as a creative and what I am capable of doing. The biggest change for me is my private outlook, my self-talk, what I believe about myself. Change in those will bring about the most change in me and how I approach my writing. Yes, 2016 is my year of CHANGE, the follow-up to and continuation of POSITIVITY – my word in 2015. My life as caregiver will continue as it has been, with the change being in me, in how I use my other time. There’s no progress in wishing things were different. This could be an exciting year, a challenging year, a surprising year. * If YOU are interested in writing children’s books, it is not too late to sign up for 12×12. Just follow the link I provided above in my point #4. PiBoIdMo — I won the challenge! the first day of Post-PiBo. Post-PiBo is the week after the inspirational Picture Book Idea Month (brain child of Tara Lazar), the week when daily guests post encouraging and helpful advice on how to proceed with all our ideas gleaned in thirty days. Yesterday, November 30, was the last day of the 30-day challenge to write a picture book idea each day – any idea that could be used in creating a picture book. This was my fifth year of taking on PiBoIdMo and it is my most creative to date. I’ve completed (won) in the other four years I’ve done this, but this year? This year I surprised myself. On day 17 I already had 30 ideas! By the end of day 30, the final day of the challenge, I completed with 65 – yes! 65! – ideas. Here’s my badge to prove it. Yessiree … I’m doing my happy dance! Not quite like that but you get my point. Actually, if when even one of my ideas is developed into a picture book and makes it to being published, the above will be even less of the happy dance I’ll be doing. You can be sure of that. 🙂 Perhaps you will join me? One year I won one of the prizes given out at the end. It was a cute caricature of me, based on the illustrator’s insect characters. I may show you sometime what he sent me. I think it’s meant to be a combination of a firefly and a mosquito – or a misinterpretation of a firefly. Tara Lazar does an amazing job of putting together six weeks of inspiration for writers of all skill levels and experience. She is a published picture book author herself, having written The Monstore which I reviewed here, Little Red Gliding Hood, I Thought This Was a Bear Book, and Normal Norman. She has two more picture books coming out in 2016. I urge you to buy, borrow, and for sure .. read and share .. her books. Right now I am happy and feeling a little proud of myself for managing to go beyond what I’ve done before. This time I will complete manuscripts. What or who inspires you? What challenges helped you to go beyond what you thought you could do? In looking back over 2014 there are many things I was reminded of that occurred both here and in my personal life — some of the latter I shared here. Here’s a condensed review followed by my annual report compiled by WordPress.com. 1. I posted the final weeks of “Read More Books Challenge” run on my blog through October 3, 2013 to January 9, 2014. My challenge got a few people reading more classics and reminded us of the many great books we have yet to enjoy. I’m still trying to read from that great list of 623 books. Are you? 2. We were privileged to have Sue Harrison continue to post teachings from her “Writing the Third Dimension” each month. (Thanks, Sue!) Has this been helpful for you? 3. I interviewed 6 authors during the year and reviewed 46 books on my blog. I also posted those reviews on Amazon.ca, Amazon.com, chapters.indigo, LibraryThing, BookLook Bloggers, Shelfari, Goodreads. 4. In June I shared my 10 tips for authors from the perspective of a book reviewer. 5. In July I was interviewed on Leanne Dyck’s blog. She is discontinuing interviewing so I was blessed to have been included before she made that decision. You can read that interview again HERE. 6. In July I added another page to my blog, “Buy The Book!”, to help my readers find the books they read about here and other places I reviewed them. Has this made it easier for you? 7. In August I added a page, Suicide Crisis Lines, mainly because of the shocking death of Robin Williams. My heart still sorrows over that tragedy. 8. In October I reported about a fantastic program – Kindle Kids Mastery – for writers of children’s books. It’s really for anyone who wants to try publishing an e-book. Please check on my Writer’s Helps page for the link to that information. It’s a fabulous opportunity. Have you used this program yet? 9. In November I participated again in Tara Lazar’s Picture Book Idea Month, aka PiBoIdMo, and succeeded in meeting and surpassing the goal of 30 ideas. Did you try it in 2014? 10. In December I participated in Susanna Leonard Hill’s story writing competition and posted my story here on my blog as required. Although my story didn’t make the cut it was great practice for me, and a good learning experience. 11. On my “Books I Read This Year” page I reported that I managed to read 45 books, far less than I had hoped to read but more than I read last year. How many books did you read in 2014? All in all, I feel 2014 was a good blogging year for me, even though I didn’t accomplish everything I wanted to. Being a caregiver for a victim of Alzheimer’s has its challenges, and my own personal stuff added in made it harder to do all I was hoping to do. Even so, I am happy and encouraged that my blog following increased this year! What would you like me to know about your experience and visits here? Now for the fun report from WordPress.com. There were 230 pictures uploaded, taking up a total of 70 MB. That’s about 4 pictures per week. The busiest day of the year was September 15th with 99 views. The most popular post that day was Book Review: I Only Cry at Night – by P. Allen Jones. In 2014, there were 140 new posts, growing the total archive of this blog to 452 posts. Visitors came from 104 countries in all! Most came from The United States. Canada & U.K. were not far behind. Soon it will be Christmas Day; I have a lot to do at home and at Dad’s to even feel ready for this special time of year, but I have begun – with help. I appreciate the beauty of this season (not the intense cold that comes with it) and especially the true meaning of Christmas. Just at the last moment I came up with the cutest title which has me thinking of a story to go with it. The great news is I completed PiBoIdMo with a win. The goal was to have 30 ideas, be they ever so small or detailed, and I got almost 50. YAY! Picture Book Idea Month is truly helpful when one is pursuing creative writing goals. Now Tara Lazar has begun a week of Post-PiBo posts which are a fantastic way to end this month-long event. She is genius in her contribution to the world of writing for children, and I’ve been very encouraged along the way – thanks to her. The next fun part is after all this ends Tara has the task of giving out prizes to those of us who completed the challenge. Of course, with so many of us signed on not everyone will win a prize, but we are all winners if we participated in this event and took in what all the authors, illustrators and agents shared with us. It’s been an especially good PiBoIdMo for me at a time when I really needed to put my mind on creative things. Did you take part in PiBoIdMo; if so how did you do? OR … Do you have any other successes to share, or goals you wish to achieve? Picture Book Idea Month (aka PiBoIdMo) began today! Today is a great day for picture book authors and illustrators. 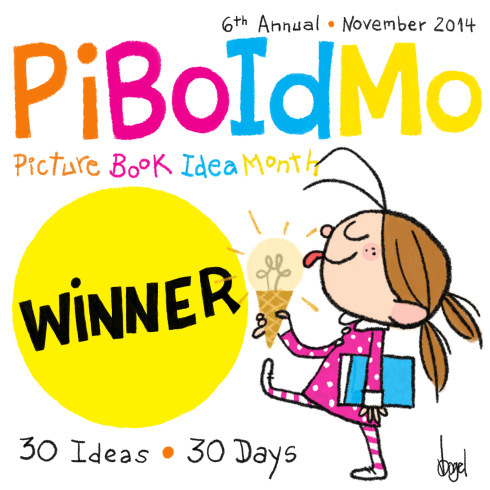 Today is the first day of Picture Book Idea Month 2014, also known as PiBoIdMo. (Learn more HERE.) Thanks to Tara Lazar who is the creator of this inspiring challenge, November 1-30 is brainstorming month for those of us who appreciate the push, nudge, encouragement to capture our ideas. (Read my interview with Tara HERE.) This morning before I was out of bed I was thinking about this being Day One of PiBoIdMo and how I just didn’t want to get out of my bed yet … and an idea came to me for a picture book! Yay! I still haven’t written it down but that’s next on my to-do list. Maybe in the next couple of brainstorming days I can add to that story by coming up with my character’s name and a great title for the book. Or maybe I will settle on those today – now the imagination wheels have begun to turn again. Either way, I will try to keep track on my blog as I progress with this year’s PiBoIdMo challenge. It is not too late if you are interested take part in Picture Book Idea Month; you have until midnight of November 7 to read about it and register HERE. Each November since 2010 I have worked on a YA fiction novel, last year being the least I added to it. With a little regret, this year I decided to not participate in National Novel Writing Month (NaNoWriMo). This means I may not even finish my novel, but I surely want to! My problems are tiredness, trying to beat back depression, too much going on in my brain as it is – including all I feel I have to do or should be doing but not wanting to overextend myself further. I care about my own health, and if I get sick I am of little help to anyone else. My dad needs me, my sister needs my contributed half in caring for Dad, my husband and daughters even need me sometimes. And, of course, little Meyya needs me. Okay, there. Does that sound convincing enough? Even though this month I’m not officially adding to my novel through NaNoWriMo, my fiction story stays on the back burner of my mind. I’m not sure how to bring it to its natural end yet, but the characters won’t go away. It seems they’re telling me this is a novel that needs to be completed, which I plan to do. In fact, I’m kind of excited to see how it turns out! Share with me your thoughts on this. What do you find to be the main thing that prevents you from moving forward, and how do you conquer it? Any tips for me on how to better divide and manage my time?